The UN General Assembly (UNGA) at the 71st session in 2016 decided to convene at UNHQ in September 2019 a one-day high level review of the progress made in addressing the priorities of small island developing States (SIDS) through the implementation of the SIDS Accelerated Modalities of Action (SAMOA) Pathway. The UNGA also decided that the high level review will result in “a concise action oriented and inter-governmentally agreed political declaration”. During the 72nd session in 2017, the UNGA further decided to convene in 2018 regional preparatory meetings as well as an interregional meeting for SIDS to review the progress and implementation of the Samoa Pathway at the national and regional levels. These meetings will be facilitated and supported by UN-DESA through the SIDS Unit, OHRLLS and by relevant agencies of the UN system including regional Commissions. The SIDS Focal Points Meeting will be held on 29 October 2018. The United Nations Office of the High Representative for Least Developed Countries, Landlocked Developing Countries and Small Island Developing States (UN-OHRLLS) is convening the inaugural SIDS National Focal Points (NFPs) meeting in Apia, Samoa on the margins of the Inter-regional preparatory meeting for the Mid-Term Review of the SAMOA Pathway. The NFP meeting will launch the network of SIDS national focal points to enhance the coherence of SIDS issues in UN processes, including at the national, regional and global levels, by providing a vital link between the global level and the national level facilitating coordination, information sharing and planning on the implementation of the SAMOA Pathway and the Sustainable Development Goals (SDGs). The NFP meeting will also provide national focal points with the opportunity to participate in the Inter-regional Preparatory Meeting of the Midterm Review of the SAMOA Pathway offering a unique opportunity to: i) share experiences and best practices on mainstreaming the SAMOA pathway and SDGs into national development processes as well their implementation and follow up, ii) network, and iii) better understand existing means of implementation, including viable financing and business models. The inter-regional preparatory meeting for the Mid-Term Review of the SAMOA Pathway will be held 30 October - 1 November 2018. The outcomes of the regional dialogues, and the Samoa Partnership Dialogue, which will be presented to participants at the meeting for feedback, will include the SIDS Partnership Criteria and Norms, a set of proposals for strengthening the monitoring and review of partnerships for SIDS. To support the outcomes of the regional dialogues, and the Samoa Partnership Dialogue, UN DESA is developing a SIDS Partnership Toolbox, which will be presented for feedback. The Toolbox, which will be available in print and online, will include the in-depth analysis of existing partnerships for SIDS, online learning material based on case studies and best practices of SIDS partnerships, and tools for assisting in the monitoring and review of partnerships for SIDS. The Samoa Partnership Dialogue will include both a main plenary segment, and a set of Partnership Networking Exchange sessions. The Samoa Partnership Dialogue will include some space for networking among partnership focal points and government officials, for showcasing and discussing partnerships and innovative solutions, and further explore the potential of scaling-up existing, and launch new, partnerships in line with the priorities of SIDS. Partnership Exchange Networking sessions will be held outside the plenary hall, and will include facilitated dialogues between partnership focal point, interested SIDS, and other participants, for showcasing and discussing partnerships and innovative solutions, and further explore the potential of scaling-up existing, and launch new, partnerships in line with the priorities of SIDS. Please indicate your interest in attending any of the sessions by clicking on the Sign up-button below, which will assist the organizers with scheduling. The Island Resilience Partnership is a public-private partnership designed to support communities on the front lines of climate change by accelerating their transition toward renewable energy and resilient infrastructure – at no-cost to governments and island stakeholders. The partnership utilizes predictive analytics, mapping technology, and a competitive marketplace to design, develop, and deploy distributed energy resources to help islands achieve climate mitigation and climate adaptation goals. The partnership is looking to scale up its activities, seeking collaborations with all SIDS interested in transforming its national energy infrastructure. The University of Delaware, along with university partners from across all SIDS regions, is launching the SIDS University and Research Institutions Network, with the overall objective to mobilize resources and coordinate research efforts to advance the SAMOA Pathway. The Strategic Plan for the Network will include mechanisms to create proactive and empowered research partnerships geared directly towards providing a sound scientific knowledge, data and evidence base that supports the progress of countries towards the goals of the Samoa Pathway and the SDGs, by promoting responsive and relevant science, technology, research and innovation to support and underpin sound policy, management and SIDS governance decisions. The networking session will provide an opportunity for SIDS and others to provide ideas and input to future research activities of the Network. Interested parties are invited to join the Network, which is open to universities and governments from Small Island Developing States. The Pacific Islands Universities Research Network (PIURN) is a consortium of all universities in the Pacific Islands Countries established in 2012 to enable closer and meaningful collaboration among researchers in the consortium, with the view to identify and address, via Research, Development & Innovation, priority social, and economic development, and environmental challenges for the Pacific Island Countries (PICS). PIURN conducts fundamental and applied research, and is currently focused on 4 broad areas that address the Samoa Pathway priorities: (1) Food Security & Nutrition, and Health & Non-Communicable Diseases; (2) Climate Change & Biodiversity, including Land Degradation; (3) Capacity Building, and Data & Statistics; and (4) Social Development, Gender Equality & Education. The Network is therefore in a strong position to help develop research-based proposals in these areas, seek funding for the proposed projects from international funding organizations and carry out research and development for the successful projects. On December 2017, the United Nations General Assembly proclaimed* the UN Decade of Ocean Science for Sustainable Development. The Decade will strengthen the international cooperation (mobilizing partnerships and leveraging investment) needed to develop the scientific research and innovative technologies that can connect ocean science with the needs of society. It will provide a common framework to ensure that ocean science can fully support countries in the achievement of the 2030 Agenda for sustainable development, contributing not only to SDG 14 but also to all SDGs. More coordinated and consolidated observations will also contribute to the SAMOA Pathway (and other UN processes protecting the ocean and its resources). The Decade will also improve the scientific knowledge base through capacity development and transfer of marine technology to Small Island Developing States. The Decade will require the engagement of many different stakeholders to create new partnerships and applications, including the ocean science and technology community, governments and policy makers, businesses and industries as well as civil society and NGOs. * Prior to this proclamation, the International Decade proposal was registered by IOC as a voluntary commitment to the UN Conference to support the implementation of SDG 14 and as a SIDS Partnership (#SIDSACTION15527). Sandwatch is an activity-oriented program, initiated by UNESCO, which has been operational since 2001. Children, youth and adults work together to monitor, design and implement practical activities and projects to address issues facing their beach environment and build resilience to climate change. The key objectives of the partnership are: (a) to expand and enhance the Sandwatch International Database to become a community-based observatory of changing coastal environments; (b) to use new technologies to expand networking between islands to share information and solutions relating to coastal issues; (c) to develop Sandwatch as a citizen science initiative that engages schools and communities through beach enhancement and improvement activities. Sandwatch is an example of education for sustainable development and contributes to implementation of the SAMOA Pathway (esp. paras 44.a, 44.c); and SDG targets 4.7 (education for sustainable development) and 13.3 (Improve education on climate change). It has been implemented in over 15 SIDS in the three SIDS regions, especially the Caribbean, and it has been introduced in many others, through regional and national training of trainers. Work to scale up the database continues, and SIDS continue to express interest in integrating the Sandwatch tool into their ESD and community coastal management plans. Partners are sought to step up engagement in all SIDS, especially in the Pacific and AIMS. Partners include: research institutes, education and other relevant ministries (environment, natural resources, fisheries, etc. ), schools, universities, community groups, etc. Sandwatch is also involved in a Citizen Science Global Partnership and a working group on citizen science and SDGs, to assess how citizen science data can serve in SDGs monitoring. The ICT4SIDS Partnership is focusing on Smart Collaborating Hubs and a Smart Global Village for Rapid and Massive Implementation of the Samoa Pathway, the SDGs, the Sendai Framework, and the Urban Agenda. Over 50 Smart Collaborating Hubs in over 15 countries have been deployed so far. In 2019, the partnership plans to implement a Smart Global Village with more than 200 Smart Hubs, spanning more than 50 countries, collaboratively supporting health, education, public safety, public welfare, food & agriculture, entrepreneurship, energy, e-commerce for cottage industries, e-government and other vital services needed by the underserved populations. To rapidly scale-up the work in the coming 3-5 years, Free Pilot Projects are being offered to interested SIDS. Beyond the Stars (BTS) is a world-first health intervention and education program that uses storytelling and innovative technology to combat non-communicable diseases, combining storytelling mediums, play-based learning, health research, regional agendas and school curriculum to inspire long-term behavior change in children across the Pacific Islands. Through this experience, every child is empowered to decide their own future, and the future of people around them. BTS uses Virtual Reality to introduce the narrative in first-person. In it, each child becomes the hero of the story as they project their agency throughout the story world, and then the real world. The initiative is looking to expend the initiative to interested Small Island Developing States. Genuine and durable partnerships for Small Island Developing States play an important role in advancing sustainable development at the subnational, national, sub-regional, regional and international levels to enhance international cooperation and action to address the unique and particular vulnerabilities of SIDS, and by harnessing the full potential of engagement between governments at all levels, businesses, civil society and a wide range of other stakeholders. As part of the support to the SAMOA Pathway mid-term review preparatory process, UN DESA has conducted an in-depth analysis of partnerships for Small Island Developing States, including partnerships that were announced in the context of the SIDS Conference in 2014, the UN Ocean Conference in 2017, and other relevant partnerships. Discussions from the regional dialogues and preparatory meetings have made an important contribution to the analysis. The session will start with a presentation of the in-depth analysis of SIDS partnerships, including their status and trends, how they have addressed and impacted Samoa Pathway priority areas, potential gaps, challenges, and lessons learned. The in-depth analysis provides an opportunity to take stock of the current status of partnerships, including their role in advancing sustainable development in SIDS, and how the next generation of partnerships might effectively address current and emerging priorities, potential gaps, and overcome challenges to implementation. How do we best ensure that lessons learned by partnerships are documented and widely shared? What gap areas should new partnerships address, both regionally and globally? How can new partnerships be better designed to overcome challenges? How can we facilitate better dialogue between partnerships within and between regions? How can we better measure the impacts of partnerships on their beneficiaries? How do we ensure better information flow between partnerships and regional and global processes that measure their collective impact on sustainable development in SIDS? The regional partnership dialogues have stressed the need to better understand, and define, what is meant by a durable and genuine partnership, to examine the lessons learned from successful partnerships, the challenges faced in implementation, and fostering better stakeholder engagement in partnerships. The SIDS Partnership Criteria and Norms provide a solid basis for articulating what constitutes a genuine and durable partnership for SIDS. To foster a better understanding of the elements of the SIDS Partnership Criteria and Norms, UN DESA has developed case studies on the design and development of existing partnerships for SIDS, which will form the basis of learning material, to be part of the outcome of Samoa Partnership Dialogue. The session will provide an opportunity to share and engage in a discussion on best practices and challenges around the development and implementation of partnerships for SIDS. The session starts with a brief presentation of the case studies and the learning material. Why chose partnership as approach for more effective implementation of sustainable development? What are the main challenges to a SIDS partnership? How can challenges be overcome? What are best practices of a partnership? How can we better identify them and ensure continued practice? What makes a partnership genuine? What makes a partnership durable? What makes a partnership effective? The regional dialogues stressed that partnerships must be inclusive of all stakeholders, including NGOs and civil society, youth, women, and marginalized groups, for maximum buy-in from communities, ensuring no one is left behind. 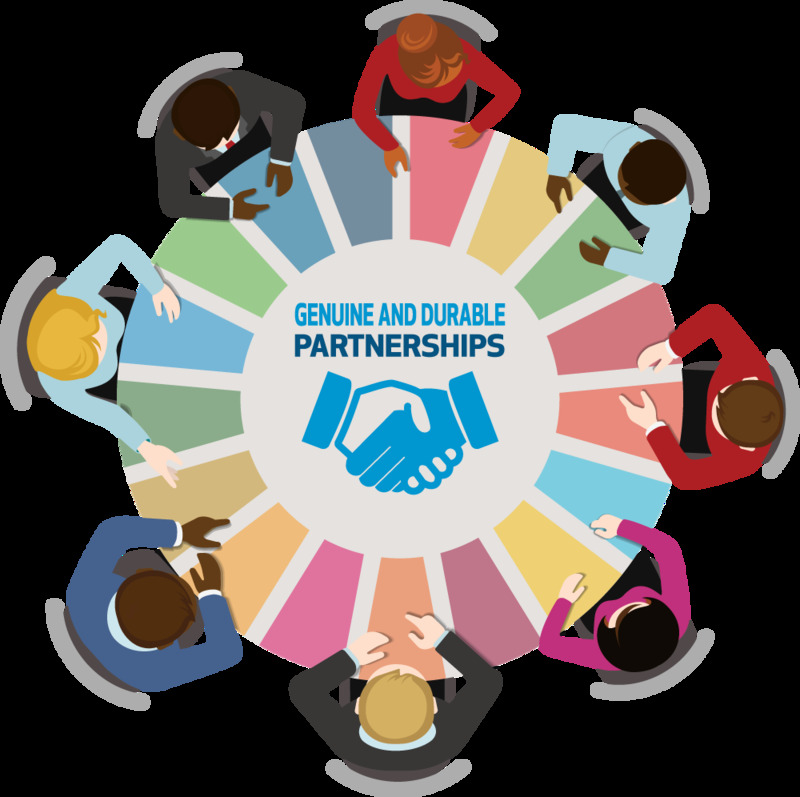 Partnerships should strive to be participatory, have agreed-upon objectives, shared responsibilities and undertake joint action towards a common goal, bringing together stakeholders from the the design of the partnership, maintain broad ownership and maintain dialogue with all partners, including communities, throughout the lifetime of the partnership. Further involvement of academia can improve the scientific, including social science, basis of partnerships, as well in relation to their design and monitoring aspects. Building trust, and providing meaningful engagement by all partners, including the private sector, remains a challenge for many partnerships. This session will consider how to best involve all stakeholders in partnerships, and how to ensure that stakeholders are kept engaged throughout the lifetime of a partnership. The dialogue will aim to draw from the experience of a broad range of partnerships and the people who have been involved in developing them. What are the best strategies for engaging different stakeholders in a partnership? Are there different approaches required in the engagement of youth, women and other marginalized communities? What are some of the successful strategies for engaging with the private sector? How can partnerships stay accountable to all stakeholders? What challenges need to be overcome to to ensure that all stakeholders feel a sense of ownership in a partnership? The outcomes from the Samoa Partnership Dialogue, as outlined below, will feed into the outcome of the mid-term review of the SAMOA Pathway. The SIDS Partnership Criteria and Norms have been developed by the co-chairs of the Steering Committee on Partnership for SIDS, Belie and Ireland, stemming from discussions from the regional partnership dialogues. The Criteria and Norms articulates what constitutes a genuine and durable partnership for SIDS, through outlining elements of the SMART criteria – a partnership that is SIDS Specific, Measurable & Monitorable, Achievable & Accountable, Resource-based on Results-focused with Timelines for implementation & transparency by all parties. A key request from the outcome of the 2014 SIDS Conference, the SAMOA Pathway, was the establishment of the SIDS Partnership Framework, designed to monitor progress of existing, and stimulate the launch of new, genuine and durable partnerships for the sustainable development of SIDS. Guided by a member States driven Steering Committee, the activities of the Framework have ensured that SIDS partnerships have remained high on the UN’s agenda, providing a multi-stakeholder platform for reviewing progress made by SIDS partnerships, and for sharing of good practices and lessons learned among all stakeholders, on an annual basis. In 2018, member states called upon (A/RES/72/217) UN DESA and OHRLLS to enhance the necessary analytical and advocacy support for the work of the Steering Committee, and, in particular, to ensure an annual action-oriented, results-focused Global Multi-Stakeholder Small Island Developing States Partnership Dialogue. Based on the consultations from the regional partnership dialogues, which also emphasized the need to strengthen the monitoring and review process of SIDS partnerships, a set of proposals for strengthening the monitoring and review of partnerships for SIDS will be presented for feedback by participants, and form part of the outcomes. The Government of Samoa will host a Reception at the Robert Louis Stevenson Museum at Vailima. The reception will commence at 6:00pm and conclude at 8:30pm. A schedule of all networking sessions is now available. Please indicate your interest in attending any of the sessions by clicking on the Sign up-button for each session, which will assist the organizers with scheduling. The one-hour side event will outline critical elements for developing partnerships, and present the online tools from the SIDS Partnership Toolbox. The side event will explore current trends of integrating the SDGs into higher education institutions in Small Island Developing States, and options for scaling up efforts. Building оп 25+ Years of GEF Support for SIDS: What's Next?